If you've never used PayPal before, the simplest way to pay is linking a bank account or credit card to your PayPal account. PayPal can draw directly from either source without you adding funds to your PayPal balance. That said, if you do want to add money to PayPal from your bank, that's not difficult either. While you can complete this entire process from the PayPal mobile app, it's a better idea to add your bank account on a desktop or laptop with a web browser. Start by signing in to your account. Go to PayPal, and select Sign In in the upper right corner of the screen. If you don't already have a bank account linked, select Link a card or bank in the lower right side of your dashboard. After you follow the link, you'll be taken to a new page that asks whether you want to link a debit/credit card or a bank account. Select link a bank account. You can link a credit or debit card here to pay with, but you can't transfer funds from a card of either type to PayPal. On the next screen, PayPal will show you the logos of popular banks. Select the one for your bank. If it's not on the list, select I have a different bank. Next, PayPal will present you with a form to sign in to your bank using the same login information you use to sign in to your online banking dashboard. This is the simplest and most direct way to link a bank account. If your bank wasn't on the list or you don't have online banking set up, select Enter account number manually instead to set up your bank manually. Enter your account and routing number on the next screen, then PayPal will send test transactions through to test your bank. This process will take a couple of days to complete. 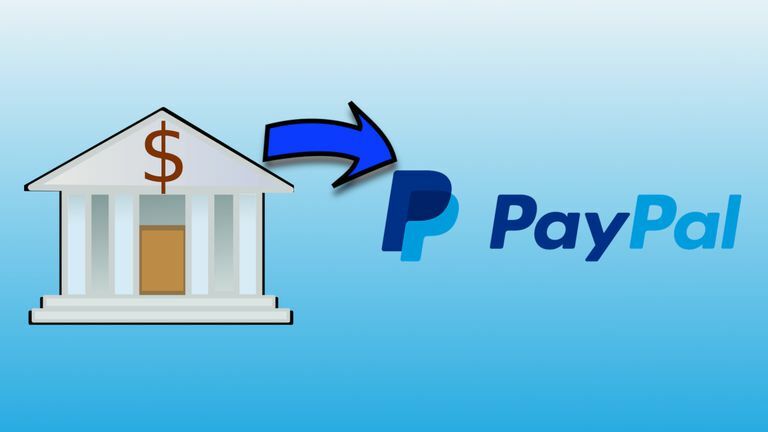 After your bank is set up and linked, you can begin to transfer funds to PayPal. On a desktop or laptop: Return to your PayPal summary and select Transfer Money to begin. On the mobile app, tap the three vertical dots to the right of "PayPal Balance," then tap View details. If using the Paypal website, select Add money to your balance. In the app, tap Add Money near the bottom of your screen, then tap Add from bank. This next screen is the last one you'll need. Toward the top, you'll see a box containing information about your bank account. If you have multiple accounts linked to PayPal, select the box to select the account you want to work with. Below that, you'll see a box to enter an amount. Type in an amount less than the current balance of your linked account. When you're ready, select Add to start the transfer. This works nearly the same on mobile. Simply enter your amount and continue. The transfer will take several business days to complete, so sit back and be patient.